Day 1: Arrival – Transfer – Check in – O/N Yerevan. 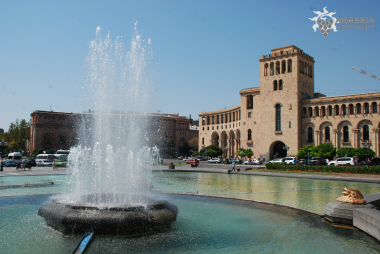 Day 2: City Tour – Matenadaran – Cascade – Republic Square – History Museum – Opera House – Lunch – Bagramyan Street – Genocide Museum – Sport Complex – Hotel – Megerian Carpet -O/N Yerevan. Day 3: Yerevan – Charents Ark – Geghard – Garni – O/N Tsakhadzor. Breakfast in the hotel. Check out from the hotel. After breakfast driving to Charents Ark. Charents was an Armenian poet, writer and public activist. 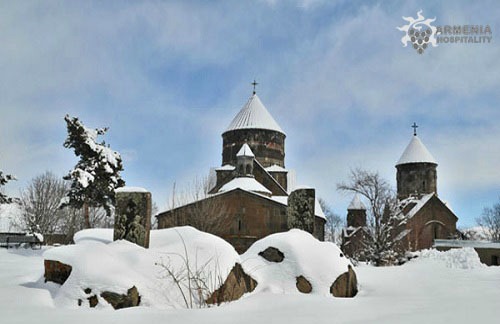 Higher up the gorge of the Azat river, there is a magnificent monument of medieval Armenian architecture Geghard monastery inscribed in UNESCO World Heritage list. Geghard is another incredible ancient Armenian monastery, partly carved out of a mountain. Departure to Garni Temple. It was built in the first century A.D. by the Armenian King Tiridates and it is dedicated to a heathen god, probably to Mithra, the god of the sun whose figure stood in the depth of the sanctuary. Lunch in habitat house. After lunch driving to Tsakhadzor. Check in . Tsaghkadzor is a spa town and a popular health resort in Armenia, located north of the capital Yerevan in the Kotayk Province . Tsakhkadzor has been Armenia’s main winter tourism destination since early 1970s and the town hosted the USSR Olympic team (summer not winter!) in 1968 for altitude training, before the Olympics in Mexico, as Tsakhkadzor is at roughly the same altitude as Mexico City. It is located 60km from capital Yerevan. O/N Tsakhadzor. Day 4: Tsakhadzor – Kecharis Monastery – Small city tour – Lunch – Skiing – O/N Tsakhadzor. After breakfast visiting Kecharis monastery .It is an 11-13th-century monastery, located 60 km from Yerevan, in the ski resort town of Tsakhkadzor in Armenia. After small city tour leisure time and skiing. Tsakhkadzor has been Armenia’s main winter tourism destination since early 1970s and the town hosted the USSR Olympic team (summer not winter!) in 1968 for altitude training, before the Olympics in Mexico, as Tsakhkadzor is at roughly the same altitude as Mexico City. It is located 60km (37 miles) from capital Yerevan. Most trails are suitable for beginner level skiers and snowboarders. For best snow cover and weather we recommend skiing in February, although you can ski from end of December to early April. There are excellent conditions for off-piste skiing and snowboarding. O/N Tsakhadzor. Day 5: Tsakhadzor – Skiing and Leisure – Funicular (rope-way) – Lunch – O/N Tsakhadzor. After breakfast walking to the ski area. 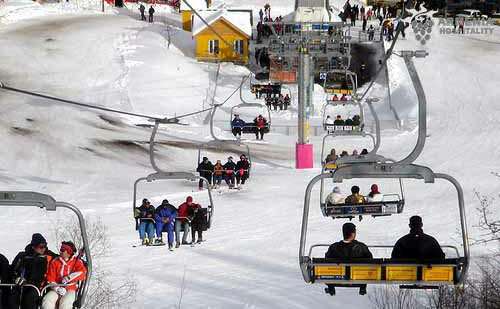 Armenia has one main ski area on Mount Teghenis which rises 2,820 meters (9,260 feet) above sea level. The five chairlifts (including a quad chair) provide a vertical drop of 850 metres (2,790 feet) and the area is famed for its empty slopes, spectacular views and very low priced lift passes compared to Western Europe or North America.There is no doubt that a winter holiday spent on a ski resort is definitely one of the best ways to enjoy the magic of the snowy season. 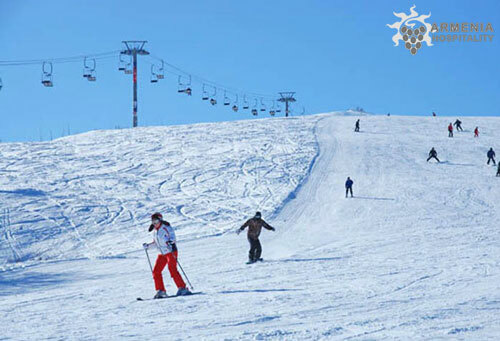 Scenic routes, ample off-piste opportunities, well-groomed slopes, a unique après-ski scene are waiting for you in Tsakhkadzor – one of the main tourism and leisure centers in Armenia, to give your sore body a little pampering. You can ride mountain bikes and snow mobiles, play bowling (in “Kecharis” hotel), skate at the ice-rink on the town’s central square… O/N Tsakhadzor. Day 6: Tsakhadzor – Yerevan – Rest – Ararat Brandy Factory – Zvartnots – Echmiadzin – O/N Yerevan. After breakfast driving back to Yerevan. Check in. Rest . After lunch visiting Ararat Brandy factory. Ararat Brandy Factory is the leading enterprise of Armenia for the production of alcoholic beverages. Its main brand name is Ararat. Walk around the ageing cellar and see how the brandy spirits are preserved, know who have nominal barrels and enjoy the delicate aroma of the cellar. Pass a pleasant and memorable time in the tasting hall enjoying the delicious “THREE STARS”, “AKHTAMAR”. 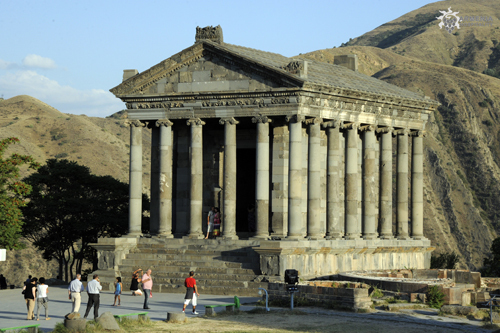 Zvartnots temple – the pearl of the 7th c. architecture (inscribed in UNESCO World Heritage list). Continue the tour to Echmiadzin .The Church was built between the years 301 – 303 AD under the Armenian king Tiridates III and the first Armenian Catholicos, St. Gregory the Illuminator. Back to Yerevan . Day 7: Check out – Transfer – Departure!